I want one of these. Sure I would flal off but it would be fun while it lasted! Jet ski and hydropropulsion extraordinaire, Franky Zapada, developed a Flyboard three years ago where users could channel their inner dolphin nature to flit about the water. Now, Zapada is back with a totally rad, gravity-defying Hoverboard that floats through the air and looks so surreal. The Hoverboard contraption trails behind a boat for safety, and gains propulsion above the water. The surfboard counterpart is attached to a personal watercraft (PWC) that enables the board to hover through the air. 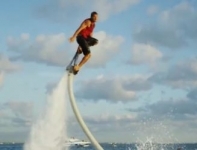 All propulsion is fed through a 60 ft hose that is attached to the board through a nozzle connecting to the jet drive of a 100+ personal Hoverboard. The board can rise up to 16 ft above the water’s surface and reach speeds up to 15 mph/hr. Before developing the Flyboard, Zapada also developed various jet skis and other nautical accoutrements. Up to 2 users can ride the Flyboard, but solo use is also available with the Electronic Management Kit that is connected to the PWC’s engine. To control the apparatus, the user holds a handheld throttle to manipulate speed and height above the water. The full Hoverboard kit will be available to purchase on June 14 for $5,850.